There is a lot to cover at a well visit, so we always allow ample time to ask our questions and answer yours. Most checkups will vary from 30-45 minutes depending on the age of your child. Will you see my newborn in the hospital? You should call our office shortly after delivery to set up your baby’s first appointment. We have privileges and an affiliation with NYU Medical Center, but our commitment to patients in our office prevents us from seeing newborns in the nursery. We recommend that you request the hospitalist, NYU Medical Center’s dedicated in-patient physician, to care for your infant in the nursery. The hospitalists are available full-time and are equipped to help you navigate any medical issues that might arise. If you are not delivering at NYU Medical Center, ask your hospital their procedure. If they do not have a hospitalist, they will probably ask your OB/GYN to recommend a Pediatrician on staff. When do I schedule the first visit for my newborn? We recommend you schedule your newborn’s first visit 1-3 days after being discharged from the hospital. Do you have same day appointments for sick visits/Do you have walk-in hours? Children do not plan when they get sick, so we will always make time to see your child if needed. We ask that parents call for a same-day appointment, rather than walk-in, so that we can find the best time to see your child. Having an appointment will minimize your wait time and also limit exposure risk to newborns and other potentially vulnerable patients. How far in advance do I need to book an appointment for a well visit? Typically we are able to fit you in within a few weeks. Back to school and camp season may be a bit longer. But please understand that the more advanced notice we have, the easier it is for us to accommodate your schedule. We usually ask you to book your next appointment upon leaving our office. Those of you with newborns will be coming frequently and newborn appointments can book up. We will try to set up the first six months of appointments at your initial visit to make sure you have your spots. What if my child is sick in the evening or on the weekend? Someone is accessible 24hrs everyday and can be reached by calling the main office number. If the office is closed, you will be prompted to leave a message for the doctor and a provider will be paged. If you do not receive a call back within the hour, please leave us another message. You also have the option to leave any non-urgent messages on a “general” mailbox to be returned during regular business hours. After 10pm, your call will be triaged by Rainbow Babies nursing service and those calls will be relayed to us the following day. Rainbow Babies provides our patients with knowledgeable, professional, and comprehensive information delivered by well-trained, certified pediatric nurses who will follow our practice’s protocol for medical emergencies and for delivering urgent medical information. When necessary, the on-call provider from Downtown Pediatrics will be notified. A scheduled appointment must be cancelled (or rescheduled) at least 24 business hours in advance or a $100 late cancel fee will be assessed. There is a charge of $40 if a vaccine-only or follow-up appointment with a provider (eg. weight check, ear check) is missed without calling ahead to cancel. This does not apply to sick visits. This fee is not billable to any insurance carrier. Please understand that if a patient is late, cancels or does not show for an appointment, another patient in need of medical services cannot be seen at that time. Help us to serve our patients better by keeping scheduled appointments. How do I transfer records? You must sign a record release (see patient forms) and give it to us to have your records transferred from your previous pediatrician. We can also fax this to your previous pediatrician for you. We are traveling internationally. Do I need special vaccines or medications? We strongly recommend you go to the CDC website (see health resources) and selecting your travel destination to see recommendations specific to your area of travel. We also recommend you bring any regular medications your child is currently taking as well as basic medicines like Tylenol, Motrin, Benadryl, and hydrocortisone which can be helpful. What is a nurse practitioner and what can they do? Pediatric Nurse Practitioners (PNPs) are advanced healthcare providers dedicated to improving children’s health. PNPs manage acute, chronic and critical illnesses and provide health care maintenance, including well child exams. PNPs are licensed to perform physical exams, diagnose and treat childhood illnesses, write prescriptions, order and interpret laboratory and diagnostic tests, provide immunizations and provide counseling/teaching. What lab procedures are done in the office? We perform most standard pediatric diagnostics in the office, including: the newborn screen (PKU), newborn hearing screens, school-age hearing, vision screening, urinalysis, rapid streps and rapids flu tests. For most other lab tests, we draw your child’s blood in the office and send it out to a lab for testing. You are welcome to book your appointments with your preferred provider as long as she is available. But we encourage our patients to see all providers at some point. We like families to be familiar with our entire team to ensure that if your child comes in for a sick visit or you call on a day when your desired provider is not in the office, you and your child will feel at ease with the provider that’s available. When will my phone call be returned? Our providers return all their phone calls themselves. During office hours the time it takes to return a phone call varies depending on how busy the office is and the severity of your child’s issue. If you are calling after hours we ask that you give our providers an hour to get back to you as they may be traveling and unable to receive the page immediately or may be assisting another patient at that time. What if I want to delay vaccines? The staff at Downtown Pediatrics believe in both the safety and effectiveness of vaccines in preventing serious illness and saving lives. As pediatricians, our priority is the health and well being of your children. We practice “preventive” medicine from birth to give our patients the advantages that will lead to a long and healthy life. The administration of vaccines is an essential aspect of our philosophy and approach to pediatric care. All available research shows that the safest and most effective way to vaccinate children is according to the schedule set by the CDC and AAP. Straying from this schedule goes against proven scientific research and puts patients who do follow the schedule at risk. In an effort to protect our patients to the best of our ability, in a world where these diseases are unfortunately still in existence, we will not accept patients who choose not to follow this recommended schedule. 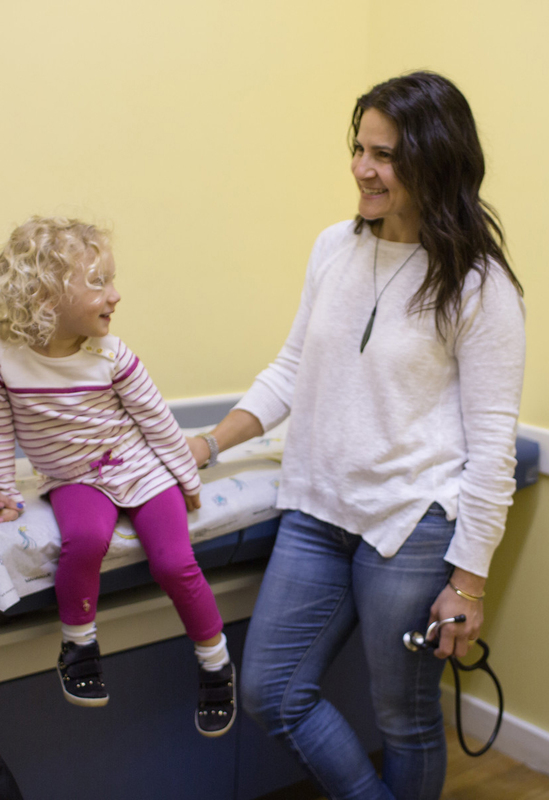 When we took my daughter in for her annual check up, at age 4, Vicki felt something that concerned her during her abdominal exam and set the wheels in motion to help us deal with the problem immediately. Ultimately her exam probably saved our daughter’s life.